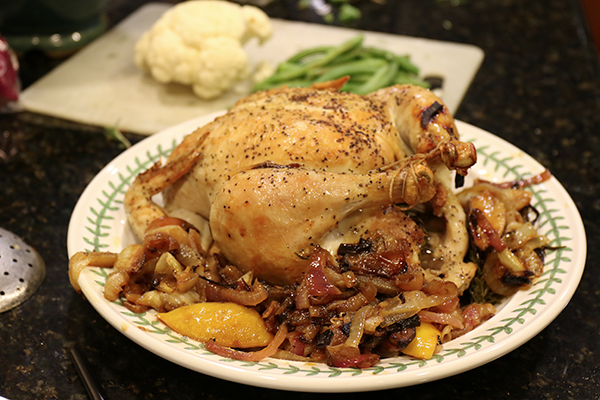 This is an excellent, quick and simple roast chicken recipe - with gravy. Credit goes to the "Barefoot Contessa" Ina Garten who calls it her "Engagement Roast Chicken" (although I have made some modifications) (Peter). 2. Remove and discard the chicken giblets (or save for stock). Pat the chicken dry. 3. Generously salt and pepper the inside of the chicken. 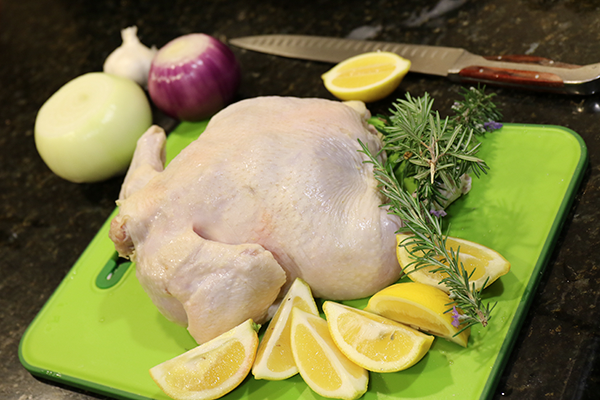 Cut one lemon into quarters, placing 2 or 3 quarters in the chicken along with the garlic and rosemary. 4. Brush the outside of the chicken with olive oil and sprinkle the chicken generously with salt and pepper. Tie the legs together with kitchen string and tuck the wing tips under the body of the chicken to prevent burning. 5. Place the chicken in a smallish roasting pan. 6. 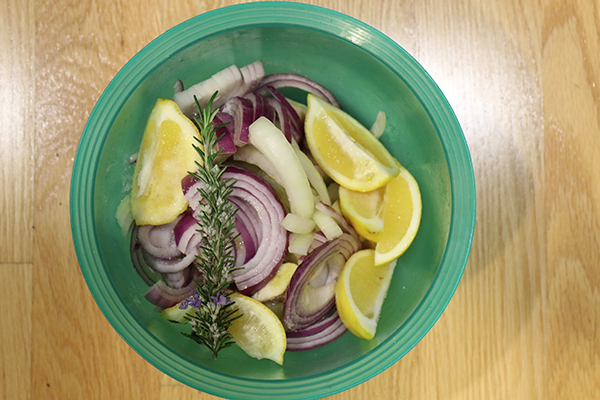 Cut the remaining lemon into eighths and with the sliced onions place in a large bowl and toss with 2 tablespoons of olive oil, 1 teaspoon of salt, 1/2 teaspoon of pepper and the rosemary if you have it. Pour the mixture around the chicken in the pan. 7. Roast the chicken for about 1 hour and 15 minutes, until the juices run clear when you cut between a leg and a thigh. And/or test for temperature - should be about 165 degrees F (according to US Gov). 8. Keep an eye on the chicken as it cooks and watch for burning or the pan drying out. If it does, add some water or stock or white wine. 11. 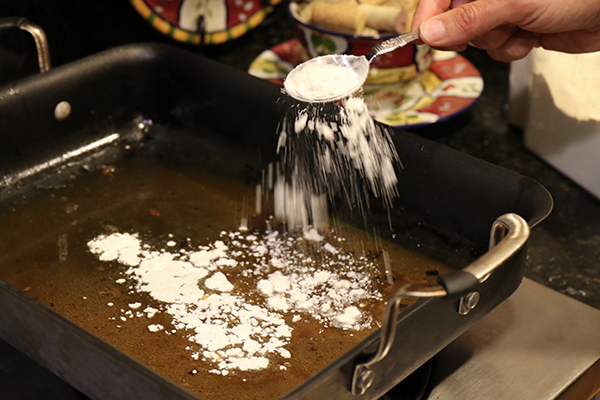 Add the stock and sprinkle on the flour, stirring constantly for a minute, until the sauce thickens. Add the juices that will collect under the chicken. Check for thickness and flavor. 12. 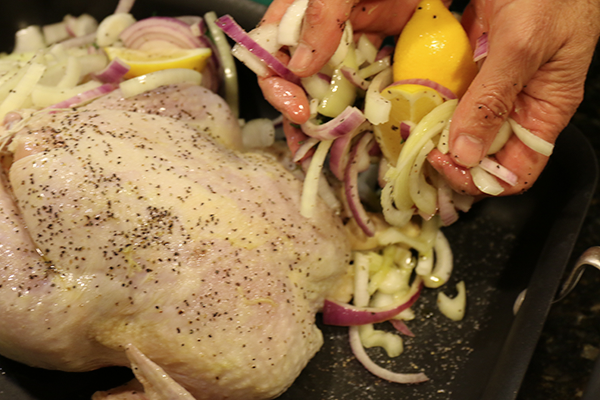 Remove the onions and lemons to the chicken serving plate (you can eat the lemons now) and carve the breasts and disjoint the chicken. 13. Pour the gravy into a gravy boat (if you want - or just spoon from the pan) and serve with the meat.